Former CIA analyst Bruce Riedel said that the Pulwama terrorist attack will be the first serious challenge of Pakistan Prime Minister Imran Khan's administration. 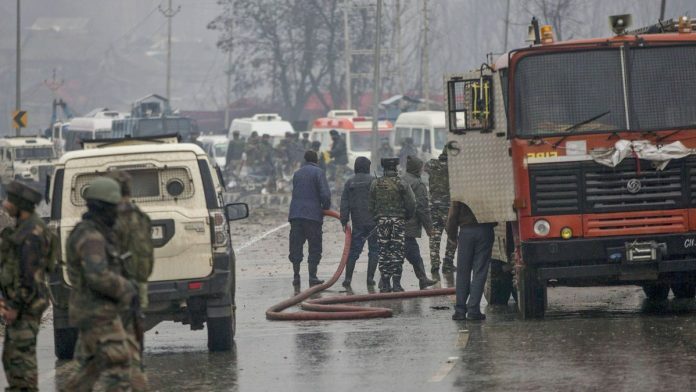 Washington: American experts suspect the role of Pakistani intelligence agency ISI in “supporting the masterminds” of the Pulwama terrorist attack in which at least 37 CRPF personnel were killed. Pakistan-based Jaish-e-Mohammad (JeM) has claimed responsibility for one of the deadliest terror attacks in Jammu and Kashmir. The experts on South Asia said the terror strike shows the United States has failed to persuade Pakistan to act against Jaish-e-Mohammad and other terrorist groups. “The self-proclaimed involvement of JeM in the attack raises serious questions about the role of the ISI in supporting the masterminds of this operation,” Bruce Riedel, a former CIA analyst, told PTI. The terrorist attack, which has direct footprints inside Pakistan, poses the first major challenges to Pakistan Prime Minister Imran Khan, said Riedel, who is now a scholar at the Brookings Institute think-tank. “This will be a real challenge for Imran Khan, the first serious challenge of his administration,” he said. Anish Goel, a former National Security Council official in the previous Obama administration, said the horrific attack highlights just how actively Pakistan-based terrorist groups still operate in Kashmir. By claiming such quick credit for the attack, Jaish-e-Mohammed is clearly indicating that they will continue to cause trouble in the region and stoke tensions between Pakistan and India, he said. In the wake of this attack, there will likely be increased pressure on Prime Minister (Narendra) Modi to take action against all militant groups still active in Kashmir,” said Goel. Alyssa Ayres from the Council on Foreign Relations said, “Unfortunately, the attack also shows the limits of US and international policy efforts to date to persuade Pakistan to take serious action against these groups. The urgent question is what else the international community can do. Prime Minister Modi cannot take it lying down but Pakistan isn’t going to be able to absorb any Indian action either. Things are simply too tense between India and Pakistan, he said. “Salman arrives in Pakistan Friday and is coming to India too. His visit will be seriously overshadowed. The Saudi relationship is too important for either side to want that to happen,” he noted. I think the damage to India-Pakistan relations is going to be immense even if the situation doesn’t escalate. The hope was that India and Pakistan will get back to talking after the Indian elections later this year. I think the hawks on both sides are going to make it very difficult for that to happen now, Yusuf said. Terrorist attacks as in Kashmir are not possible without an ideology or theology that justifies terrorism and brainwashes its followers that massacring others leads a person to paradise. The terrorist mindset must be removed along with the terrorist infrastructure on the ground, said noted Hindu scholar David Frawley. The latest attack by Jaish-e-Mohammed is another example of how Pakistan’s intelligence services continue to sponsor terrorist incursions into India, Washington-based Hindu American Foundation said. While it’s heartening to see that a wide swath of the international community is unequivocally condemning the attack, such statements of solidarity must be backed up by actions which help bring to an end the ability of such terrorist groups to kill with impunity and destabilize the region, the foundation said. China should be ashamed of itself in blocking Azhar’s ban at the UN. Indian diaspora demands that if Pakistan is sincere in seeking peace with India, it should arrest Maulana Masood Azhar and his cohorts and disband all terrorist organisations station in Pakistan. “Pakistan is a pariah nation anyhow and if it wants to exist in the real world, it should not play games, resort to lies, and abet terrorism. It should get rid of all terrorist organization from its soil, it said. “It’s long past time for Pakistan’s establishment to root out these fanatic groups, many of which operate in the open and with the support of elements of the Pakistani state. It’s unacceptable. And it’s outrageous the world didn’t draw a collective red line on this a long time ago,” Jeff Smith of the Heritage Foundation said.